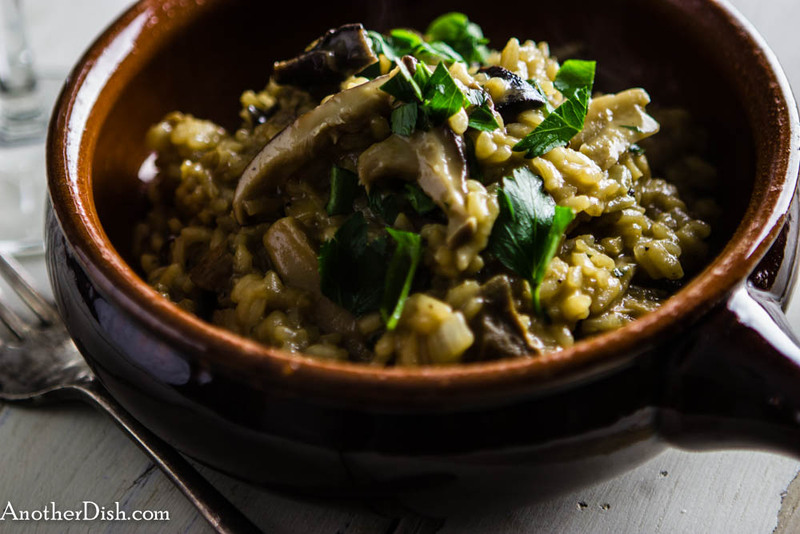 You must have patience when preparing this dish, but it’s well worth the effort — this risotto is creamy and very flavorful! If you don’t take the time to gradually add the stock to the rice, you’ll end up with a crunchy risotto that’s far too al dente (trust me). This dish makes for a perfect, light evening meal — serve with fresh sourdough bread and a glass of white wine. I hope you’ll try this tonight! 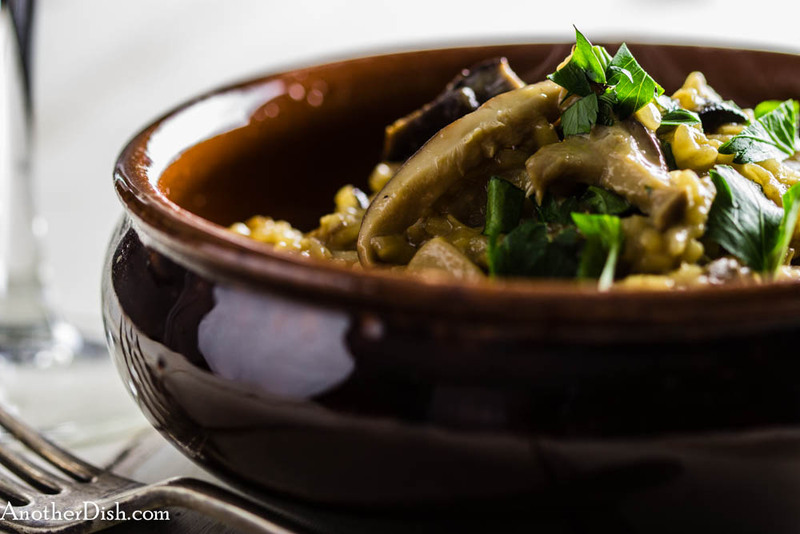 In a small bowl, cover mushrooms with boiling water. Cover and let stand 30 minutes. Strain mushrooms, reserving soaking liquid. Chop mushrooms. Meanwhile, heat 2 Tbsp of the olive oil in a large frying pan over low heat. Add garlic and saute 3 minutes. Add fresh mushrooms, and turn heat up to medium-high. Saute 4 to 5 minutes. Stir in porcini mushrooms, 1 tsp salt and 1/4 tsp black pepper. Remove from heat and set aside. In a Dutch oven, heat 2 Tbsp olive oil over medium-high heat. Add onions and saute until soft, about 5 minutes. Add the rice and stir 2 minutes. Add the wine and stir until it has been absorbed, about 1 minute. Stir 1 1/2 tsp salt into the stock. Now, this is where your patience kicks in — add stock to rice mixture, one ladle at a time, stirring each time until it has been absorbed. About half-way through, stir in the reserved mushroom liquid. Continue stirring in stock. This entire process should take about 20 minutes. Remove from heat. Stir in the mushrooms, parmesan and 1 Tbsp of the chopped parsley. Cover and let stand a few minutes. Serve, topping with additional parmesan and parsley. This entry was posted in Italian, Main Dishes, Pastas and Grains and tagged Cooking, Food, Food Photography, Foodie, Italian Food, Recipes, Risotto on February 23, 2014 by AnotherDish. This is an incredibly easy dish to prepare, yet the end results make it look like you slaved in the kitchen all day! Unlike my typical blog post, this recipe has very few ingredients, which in my mind, is key to Mediterranean cooking — fresh, simple ingredients that go very well together! Delicious. Hope you’ll give this one a try tonight! Combine garlic, rosemary, 1/2 Tbsp of the olive oil, salt and black pepper in a small bowl. In a large, shallow dish, rub chicken thighs evenly with the rosemary mixture. Cover with plastic wrap and let stand 1/2 hour. Lay the prosciutto slices on a flat surface. Roll each thigh in one slice of prosciutto; secure each involtino with two pieces of butcher’s twine. Heat 2 1/2 Tbsp olive oil in a large sauce pan over medium-high heat. Add the involtini and brown on all sides, about 13 minutes. Add wine and bring to a simmer. Cover pan, reduce heat to low and simmer gently for 30 minutes. 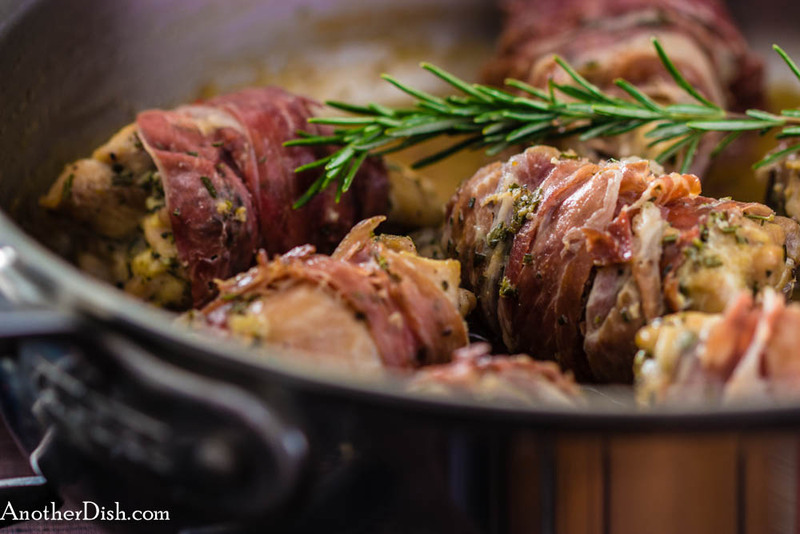 Remove involtini, remove strings (gently), cover loosely with foil and set aside. Bring the cooking juices to a boil over high heat. Add the chicken broth, sherry and sour cream and whisk until smooth. Cook sauce down until thickened. Season with additional salt and black pepper, if desired. 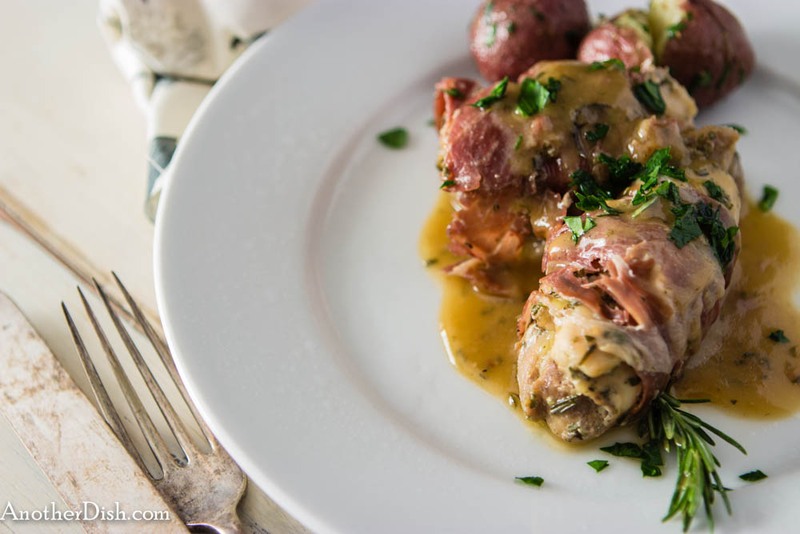 Serve involtini with sauce drizzled over them. I like to serve this dish with boiled new red potatoes and a small green side salad. This entry was posted in Chicken, Italian, Main Dishes and tagged Cooking, Food, Food Photography, Foodie, Italian Food, Recipes on February 9, 2014 by AnotherDish. Cooking with a wok is great, and can be very healthy. As the name indicates, this dish is a stir-fry, but in cooking method only — it’s quick and healthy, and its delicious ingredients are distinctly Mediterranean (for the most part). 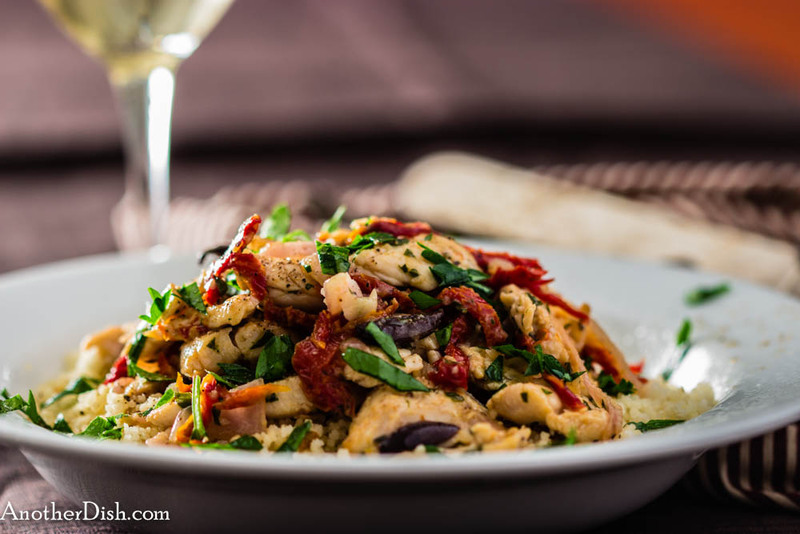 Try this dish tonight! Heat 1 Tbsp olive oil in wok over medium-high heat. Add chicken and stir fry 5 minutes. Remove from wok. Add the other 1 Tbsp olive oil. Heat and add onions. Stir fry until golden brown, about 5 minutes. Add garlic and cook 1 minute. Add back chicken. Add vinegar, sambal ulek and lemon juice. Toss well. Stir in olives, sun-dried tomatoes. Season with additional salt and ground black pepper, if desired. 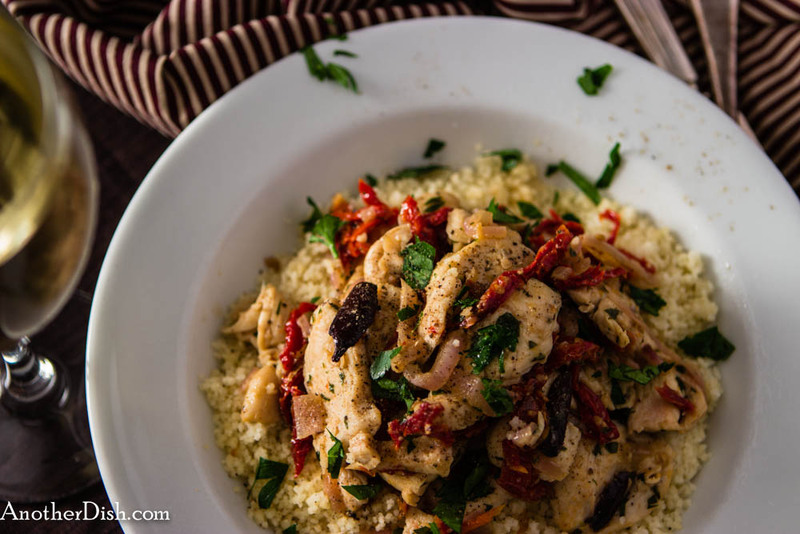 Serve over cous cous and garnish with parsley. 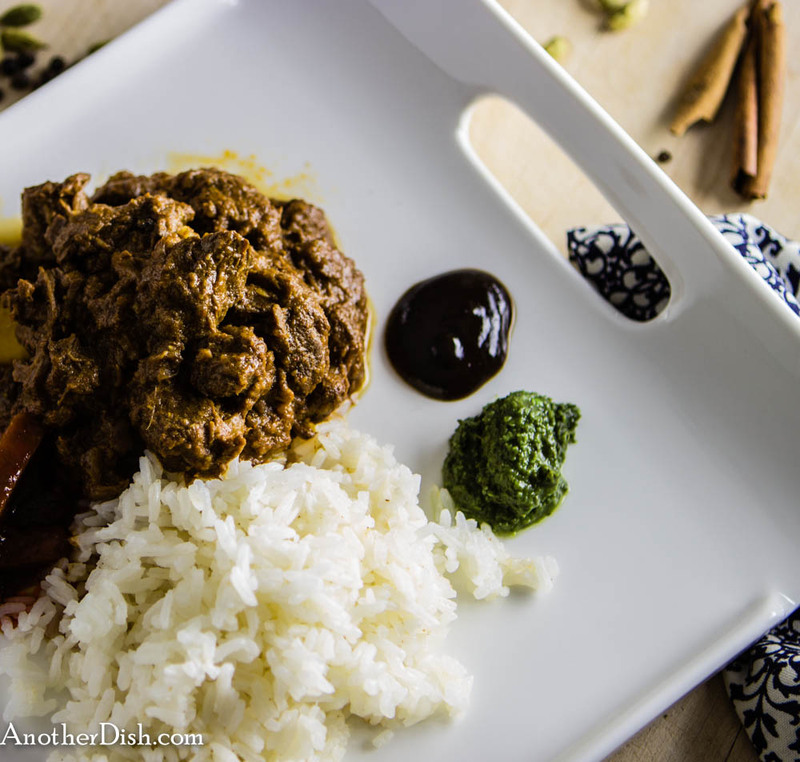 This entry was posted in Chicken, Main Dishes and tagged Comfort Food, Cooking, Food, Food Photography, Foodie, Recipes on February 2, 2014 by AnotherDish.